The latest corruption scandal in Romania has brought charges against Prime Minister Victor Ponta. Despite calls from President Klaus Iohannis for Ponta to resign, Ponta is so far refusing to go, claiming that the case will be “meticulously dismantled … through clear proof and certified documents”. The scandal threatens to produce another summer of political conflict and polarisation with attention focussed on corruption and internecine political battles rather than economic, social and international issues. Words by Daniel Brett. The announcement by Romanian prosecutors that they want to investigate Prime Minister Victor Ponta of the Social Democratic Party (PSD) for corruption offenses has triggered a major political crisis in the country. In light of the accusations, President Klaus Iohannis of the rival National Liberal Party (PNL) has asked Ponta to resign. Ponta has refused to do so, claiming innocence and that his resignation would trigger a political crisis. The situation is complex, because in order for Ponta to be fully investigated, he must have his parliamentary immunity lifted, which the parliament has thus far refused to do. As a result, a dispute has emerged that threatens to plunge Romania into another political crisis and polarise it further some six months after the presidential election. An impasse has emerged as Ponta refuses to resign, parliament refuses to lift his immunity, and the president, despite his wishes, has no power to sack Ponta or to force parliament into removing his immunity. Ponta stands accused of tax evasion and using forged invoices to buy cars and property. His immunity means that he can only be investigated for crimes that occurred before he took office. The accusations date to before he became prime minister when he was working as a lawyer. However, the investigations are only likely to increase and to delve more deeply into Ponta’s financial dealings. As discussed previously on this blog, since the election, the number of corruption cases being launched and successfully prosecuted has increased, reaching the top levels of the PSD, with Ponta and key allies having investigations launched into their activities and some being convicted. Under Laura Kövesi, prosecutions and convictions have accelerated since 2013, with over 1000 prosecutions being brought in 2014 and twenty-four mayors, five parliamentarians, two ex-ministers, seven judges, thirteen prosecutors and former Prime Minister Adrian Năstase convicted. The cases serve to further undermine the Romanian elite, as more details, as well as cash and paintings, emerge. Bribery accusations often take a bizarre and comical turn here; one former judge was probed for smuggling goats to Russia, a minister was convicted for taking sausages (and $17,000) as bribes, a third was investigated for accepting bags of cash in a cemetery, and Năstase bribes in the form of double glazed windows. The accusations and convictions have not been limited to financial crimes; last month former Interior Minister and PSD baron Liviu Dragnea was convicted and given a suspended sentence for electoral fraud relating to the 2012 attempted impeachment of then President Băsescu. Although he resigned as regional development minister after his conviction, Dragnea remains a vice president of the PSD and prominent MP. Mission impossible? Why Ponta cannot be removed. This lack of mechanisms exists in part because confrontational cohabitation between the president and prime minister was never envisaged when the constitution was drawn up. At that time, presidential and parliamentary elections were simultaneous, so the party or alliance of the president would also be the largest group in parliament. The president, although constitutionally lacking in power, became during the 1990s the de facto dominant political actor with the prime minister as his subordinate. Thus a president with parliamentary support could bring about the dismissal of the prime minister. However, since 2004, the elections for parliament and president have taken place separately, and since 2012, this has resulted in cohabitation, with president and parliament coming from parties that oppose one another. With cohabitation, conflict has emerged between the two offices, including the attempted impeachment of Băsescu in the summer of 2012. Parliamentary elections are not scheduled until 2016. Romania is also unusual in that since 1989 all parliaments have served out their full terms. With a healthy parliamentary majority it is unlikely that the government will collapse due to a loss of the majority, nor are they likely to call early elections. Thus the only way in which Ponta can be forced out of office is via parliament losing confidence in him and voting his government down. The million-dollar question is whether the PSD will choose to remove Ponta, or whether they will brazen it out. Who is Ponta, why is he in power, and what is the relationship between Ponta and the PSD/barons? 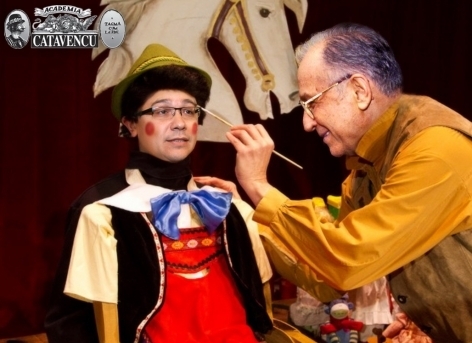 Ponta’s public image is that of a child wearing Micky Mouse ears, being manipulated from behind the scenes by the evil former President and prominent PSD member Ion Iliescu, or as Pinocchio (an allusion to his frequent lies), or as someone who will never miss an opportunity to jump on a bandwagon or to say anything to gain or maintain power, no matter how ridiculous. Translation: Iliescu: “Little one, stop your babbling noises and sing for the party, or Dragnea will trick you and put a stake through you. 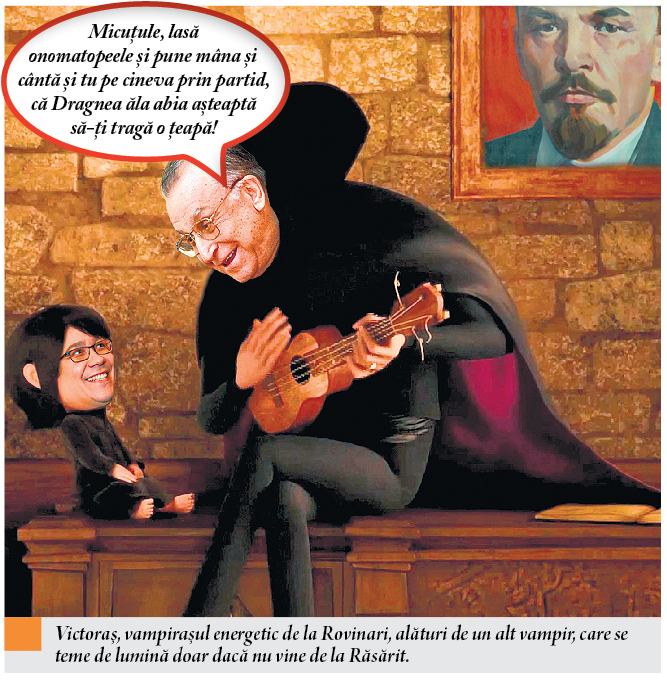 / Baby Victor, the energetic little vampire from Rovinari, side by side with another vampire, who always fears the light unless it comes from the East.” – Iliescu is warning Ponta to do more for the party; Iliescu fears everything unless it comes from Moscow – a joke about the fact that Iliescu is the only person who still believes in Stalinism. Via Academia Catavencu. At the same time, there are concerns that he is in fact a sinister politician who desires to gain and hold onto power. His willingness to exploit nationalism and religion during the election campaign, to attempt to remove President Basescu, and to ignore or rewrite the constitution to suit his aims, along with his attempt to suppress the vote of the diaspora, shows a politician prepared to push the limits. But the inability to decide if he is a Romanian Viktor Orban or Micky Mouse works to Ponta’s advantage, as he is taken less seriously than he might be. We might assume that a politician who can still command the support of the party even after the accusations levelled against him – not to mention his previous failures – must have a strong power base in the party and to have neutralised any critics. However, the reality is perhaps the reverse. One of the reasons why Ponta is not taken seriously is because he is seen as the puppet rather than the puppet master within the PSD. Ponta’s weakness and the hold that the barons have over him are precisely why they keep him in place. Secondly, the emergence of an alternative who is neither tainted by corruption nor seen as belonging to a particular faction is unlikely. Although the PSD is often spoken of as a ‘centre-left’ party, this overstates the interest that the PSD has in social justice. Put simply, for the PSD, social justice equates to increasing pensions for the elderly and wages for state employees as a form of electoral bribery. The PSD is a party which electorally draws upon the support of transition losers, those on the economic, social and physical margins, but whose party elite is almost entirely drawn from the newly rich, the well connected and those already embedded in power networks, some since before 1989. The accusations against Liviu Dragnea, a newly wealthy businessman and politician, provide a useful snapshot of why the barons are so vulnerable to prosecution, why they stand to lose so much if jailed, and why they are therefore so keen to see anti-corruption efforts stopped. Dragnea is not an isolated case, and it illustrates how various individuals rose to the position of baron. After his election as a local councillor in Teleorman (one of the poorer regions of Romania), in 2000 Dragnea privatised the state owned construction company. The auction for the company was won by Dragnea’s driver. The council, headed by Dragnea, then gave building contracts to the company at inflated prices. The relationship continued, and Dragnea now stands accused of buying a hotel cheaply and selling it for a profit to his driver, who then returned the property to Dragnea. Dragnea was not a rich man before beginning in politics; he now owns numerous properties and land across Romania with no clear source of income. He built a political and financial power base locally, which developed through patronage supporter networks, and then moved upwards into national politics, where he gained prominence behind the scenes in the PSD before taking on a more public profile. Shortly before the elections, a report emerged of Ponta being berated by a group of barons for failing to keep them out of jail. One cannot imagine a situation where the barons would shout at Iliescu or Nastase. Ponta plays a useful role for the PSD barons. His relatively weak position in the party and his dependence upon them for support means that the barons call the shots. With so many of them under investigation themselves, Ponta’s case distracts attention from them. The prosecution also opens up opportunities for the PSD and their allies who want to see an end to anti-corruption efforts. There are two potential scenarios. The first is that Ponta and the PSD succumb to the pressure and Ponta resigns, and then the PSD finds a replacement who can i) hold the party together and ii) lead the party into the 2016 elections. The second scenario is that the PSD tries to hold onto power and uses the attempt to impeach Ponta as a tool with which to attack the DNA, Iohannis and anti-corruption efforts. From events since the news broke, it is clear that the PSD is adopting the latter strategy. The PSD line of attack is to argue that DNA is over-reaching, and that democracy is under threat from DNA. They claim that DNA is engaged in a power grab and is using corruption charges to suppress opposition to it. To this end, Ponta and his supporters have invoked the way in which the legal system was politicised under communism and used by the Communists to jail their opponents. Ponta’s ally, former Liberal Prime Minister and now chairman of the Senate Călin Popescu–Tăriceanu, has attacked DNA and called for the dismissal of Kövesi and Livia Stanciu, the head of the High Court. At the same time, parliament is attempting to pass amendments to the penal code to make it virtually impossible to prosecute politicians for graft. It is likely that if these changes are passed by parliament, they will be vetoed by Iohannis and will eventually find their way to the constitutional court. All the while, these debates and rows will serve to distract from Ponta’s own case and those of other members of the PSD. The second line of attack is to continue the attempt to further polarise Romanian society. This is an extension of the discourse the PSD deployed during the presidential election, when they sought to disenfranchise the diaspora by preventing them from voting. Former Interior Minister Ioan Rus attacked the diaspora, saying that while men left for 1500 euros, their wives were forced into prostitution at home while they were away. Much of the key commercial media in Romania is owned by barons who support the PSD, particularly the Antena channels. These drive home the PSD’s narrative of two Romanias: the ‘true’ Romanians at home, being dictated to by those who are abroad. The diaspora being portrayed as out of touch, selfish, decadent and degenerate, and thus not ‘true’ Romanians. Such an argument appeals to the PSD’s core electorate. The PSD is also counting on the fact that while Romanians were willing to come onto the street in 2011 in opposition to austerity and in support of Raed Arafat, they are less willing to come onto the street in support of Kovasi, Stanciu and DNA. If the PSD is playing a long game, they are hoping that the longer it drags out, the more disillusioned Iohannis’s supporters will become, and the more likely they will be to stay at home in the parliamentary elections. A low turnout favours the PSD, who have a core (but diminishing) electorate. Iohannis is often criticised for not being assertive. His critics in the press and elsewhere lament that he is not an ‘interventionist president’ and that he ought to do more. It is something of a paradox: the very things that the media and intellectuals criticised Băsescu for doing, they criticise Iohannis for not doing. A case in point is the criticism of Iohannis for allowing Ponta to control foreign policy, as the constitution does not give the president control over this sphere. In fact, the president has very few powers over policy or politics. The Romanian opposition parties have been ineffective thus far in mobilising the population or offering up any kind of strategy for removing Ponta beyond symbolic votes of confidence. In part this reflects a lack of leadership among the centre right, which is dominated by politicians with large egos and limited electoral appeal. Furthermore, the PNL, PD-L and UDMR have as much of a corruption problem as the PSD, so while they might crave the fall of Ponta, privately they are equally happy to see anti-corruption efforts stalled or rolled back. Alarm bells rang on the 12th of June when Ponta appeared unannounced at the European Games in Baku. Most European leaders are boycotting the Games because of Azerbaijan’s human rights record. Ponta’s appearance with Vladimir Putin and Recep Erdogan did provoke some concern that he had travelled there to try to gain the support of Putin against Iohannis; however, this seems unlikely. Things became even more confused at the start of this week. On Monday, Ponta was supposed to meet with prosecutors over his case. However, he claimed to be in Turkey for a knee operation, having left his deputy Gabriel Oprea in charge until the end of the week. However, this has since been extended until the middle of July. Ponta has protested furiously about the seriousness of his operation to much scepticism. Despite his nationalism, Ponta claimed that he could not have the operation in Romania, because he would not have been allowed to recover in peace, so he went to Turkey instead. It would appear that this is a classical delaying tactic similar to that employed by Adrian Năstase, who claimed to have shot himself when facing prosecution, and by others who have suddenly become ill. By moving from the scene and making himself unavailable for DNA, it slows down the process of prosecution and allows his allies in parliament further time to pass laws in his favour. It also will likely ease some of the pressure on Ponta, who hopes that by the time he returns to office, press interest in the investigation, and hence pressure on him to resign, will have dissipated. The website of the civic movement Romania Curata (Clean Romania) suggests a worst case scenario whereby Oprea, as interim Prime Minister, would use the emergency decree powers given to him in the constitution to sign into law the anti-anti-corruption changes to the penal code, allowing Ponta to avoid both prosecution and any blame for the changes to the penal code. It is likely that, no matter what, the attempts to avoid prosecution and to chip away at anti-corruption efforts will continue throughout the summer and, similarly, anti-corruption efforts will result in more high profile politicians and business people being arrested. While the instability plays out, it damages Romania at home and abroad. The behaviour of the elite, in terms of their self-indulgence and contempt for the rule of law, serves only to erode the minimal confidence that the public has in politicians and institutions. Furthermore, economic, political, and foreign policy issues are being ignored or treated as exercises in points scoring, while no concrete initiatives are being proposed. Politically it damages Romania’s standing abroad. The economic situation is worsening as foreign investors shy away from Romania in light of their fear of another long-drawn-out period of political conflict and instability. Not that any of this will bother most Romanian politicians, whose primary objectives remain holding onto power and enriching themselves. This entry was posted in Romania and tagged anti-corruption, corruption, Daniel Brett, Ion Iliescu, Klaus Iohannis, Laura Kovesi, Liviu Dragnea, Romania, Traian Basescu, Victor Ponta. Bookmark the permalink.